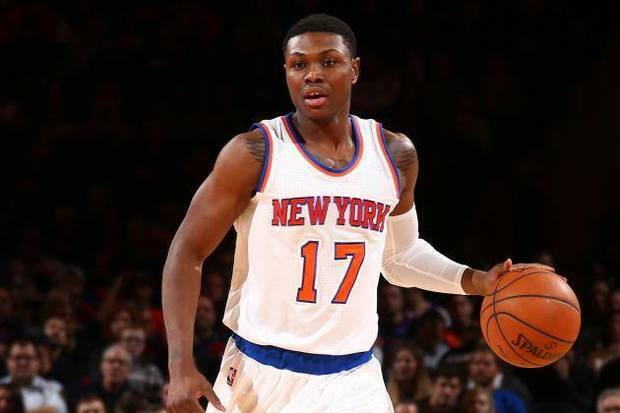 Cleanthony Early of the New York Knicks. MASPETH — Knicks' forward Cleanthony Early was shot in the kneecap by armed thieves who boxed in his Uber car and stole his gold grill and some jewelry in Maspeth on Wednesday morning, sources said. The Bronx native, whose team had beaten the Detroit Pistons 108 to 96 earlier that night, grabbed dinner in SoHo and visited some friends at the CityScapes Gentleman's Club with his girlfriend, sources said. Investigators believe that some of the suspects saw an opportunity and called their associates to the area when they spotted Early, sources said. "This is not the first time they’ve done a rip-off," a source said. Early, 24, and his girlfriend left the club in an Uber car and made it to Maurice and Tyler avenues when three cars boxed in their cab at 4:31 a.m., an NYPD spokesman said. Six men in ski masks hopped out and two of them opened the Uber's doors, sources said. "Gimme everything you got," one man said, according to sources. They stole Early's gold grill and chains and also robbed the driver, sources said. It wasn't immediately clear what they took from the driver. Early fled the scene so the robbers fired three shots at him, hitting him once in the right kneecap, sources said. He had missed two months of games during the 2014-2015 season after getting surgery on the same knee, according to the Daily News. "He’s lucky to be alive. This is definitely a Wild West crew," a source said. Early sent out a tweet Wednesday night thanking his fans for their support. The Uber driver, whose name and age were not immediately released, drove the cab around the corner to 64th Street, just off 51st Avenue, witnesses said. Early, who didn't realize he'd been shot, sought help from a nearby house, where residents let him inside to summon an ambulance, witnesses and sources said. Surveillance video shows a man, whom a witness identified as the Uber driver, walking down the street waving his arms. "He walked to the ambulance on his own without any help," said Armand Czarpkowski, 39, who lives across the street, of Early. "It was madness in the middle of the night. I was shaken up," Czarpkowski added. Early was treated at Elmhurst Hospital, where he was listed in stable condition, police said. His girlfriend, 25, was not injured in the attack, police said. The suspects were not immediately arrested, police said. Early joined the Knicks in August 2014 after leading Wichita State's Shockers through an undefeated regular season, according to his NBA biography. His teammates also came out in support. Uber officials did not immediately return a request for comment.